As a coin collector, I like to see both text and image on a coin, otherwise for me it isn't a coin. However, as a thematic collector, I tend to focus on the image, but there are times when the style of the text, or the font, is at least as noteworthy as the the image. On rare occasions the design consists of text only and no image. In 2005, the Royal Mint (UK) issued a 50p to commemorate the 250th anniversary of Samuel Johnson's "A Dictionary of the English Language". At first I was annoyed when I read that the design would be all text, but when I saw it, I fell in love with it. The designer, Tom Phillips, has used the various fonts to good effect, and obviously put a lot of thought into the design. Gothic script has been used to good effect on the coins of Danzig, as shown on this 1 Gulden coin of 1932. And famously we see it on the aptly named "Gothic Florin" of Victoria. She is depicted in a style that matches the font perfectly. It has often been said that Britain's monarchs are more German than English - perhaps this classic coin was making that point. 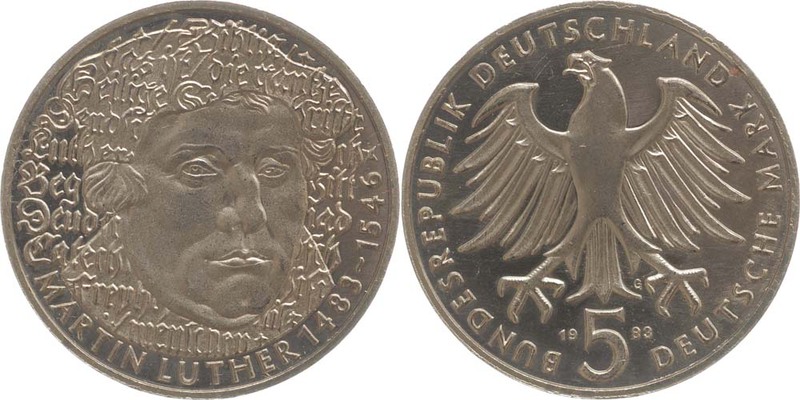 Fraktur was hardly ever used on German Empire coins. After all it is very hard to read in all caps, and the alternative (mix of uppercase and lowercase, thus different heights of characters) does not look very balanced. Just look at the nazi coinage. The Gothic script on that florin is different; works a little better with coins. You have to be careful with terminology, too - to a typesetter, "Gothic" is actually quite a plain form of font, and what we commonly call "Gothic" is known as "Black Letter". "Fraktur" is the German form of Black Letter, and there are a number of minor differences between the two, as close comparison of individual letters on the Danzig Gulden and Luther commems on the one hand and the Victorian florin on the other should show. Moving away from Gothic and Fraktur, I've always admired the interplay of text and image on the modern Indonesian coins. They're very confident and stylish in their use of different sizes of font, and in the way they overlay images with text or numerals. I also like the fonts used for the "Rp" abbreviation. For me, it is the marriage of the text and picture that gives Indonesian coins their distinctive style. Look how boldly the denomination dominates the 50 rupiah above, taking up more than half the space, and yet it still looks good. Looks German, but pretty confident it is Austrian. Two from Germany that, on the issue specific side, are "text only" - a 10 mark coin commemorating 50 years of the Federal Republic, and a 10 euro coin commemorating the 2004 enlargement of the European Union. Images from Ritter. So on the first piece we have a sans serif font, and the middle part of the text is a spiral. The other has a font with serifs, and several concentric circles. P.S. This is from "our" Tony Clayton's site. I do like the calligraphy on this one, though the outline effigy of HM doesn't quite look right to me. Those do nothing for me, I'm afraid, Christian. As an Englishman, I feel at home with the so called Roman alphabet when I see it on coins - less so with the Cyrillic and Greek alphabets. However, there are other scripts and alphabets that I do not understand, but sometimes I find they look beautiful despite this. It's a purely aesthetic experience, as I can't read the meaning that the text is conveying. Here is a Chinese coin that has that effect on me. The positioning of the text happens to be just right. 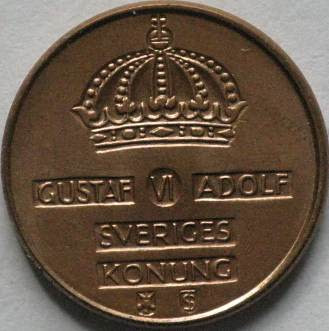 On this Swedish 1 öre coin of 1958, the text has been presented in an unusual way. The text sits within a series of incuse boxes, so that the engraving combines with the positioning to produce an unusual and original result. The predecimal coins of Ireland used Gaelic descriptions for their denominations, and they were presented in an unusual font. The coins of Yugoslavia are an interesting case, since that country was "biscriptual", meaning its peoples wrote in two different alphabets: the Latin (Roman) alphabet and the Cyrillic alphabet. Here are three coins of Yugoslavia, all from 1938. The font on this Yugoslav 1938 one dinar coin is also interesting.